Six young volunteers set up camp in the middle of nowhereto work on a project for kids. A little too much booze and one horrific, stomach-churning accident spark a series of outrageous events. Alone in the woods, guilt and paranoia begin to take hold and the bodies start to pile up. Original? Hardly, but interesting it apparently is. The directorial debut of Bradley Scott Sullivan, the prosaically titled I Didn't Come Here to Die is a slickly handled horror work starring Indiana Adams (Friday Night Lights), Kurt Cole (Up & Down), Madi Goff (A Thousand Cuts) and Travis Scott Newman (Live Fast Die Young). The PR release assures us the film "will keep you gripped throughout", a phrase we see a lot on such documents and tend to take with a pillar of salt, but it has also found favour with a number of genre critics, being described by BloodyDisgusting.com as "One of the best horror film debuts since Sam Raimi unleashed The Evil Dead" and "Slickly shot and as gory as hell" by Scream Magazine. Is hell that gory? 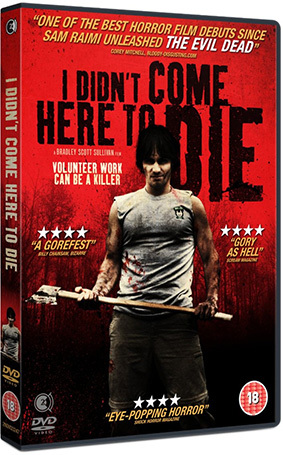 I Didn't Come Here to Die comes to UK DVD on 15th April 2013 by Second Sight Films at the RRP of £15.99. No extra features have been listed, so we'll have to make do with the obligatory trailer.